Michael Mayer and Richard Wolinsky at the Curran. 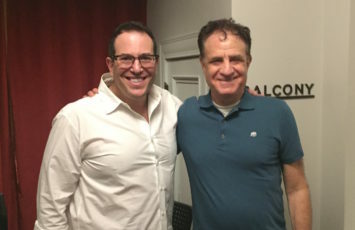 Michael Mayer, director of “Head over Heels,” a new musical with a pre-Broadway tryout at the Curren Theatre through May 6, 2018, in conversation with Richard Wolinsky. Michael Mayer won the Tony Award for Best Director of a Musical in 2007 and has been nominated three times for a musical, for You’re a Good Man Charlie Brown, Thoroughly Modern Millie and most recently, for Hedwig and the Angry Itch. He was also nominated as director for the 1998 production of Arthur Miller’s A View from the Bridge. He directed and wrote the book for American Idiot and the recent reconfiguring of On a Clear Day You Can See Forever. He directed the film version of Michael Cunningham’s A Home at the End of the World. His latest film is an adaptation of Chekhov’s The Sea Gull, starring Annette Bening and Soursie Ronin, which will be released later this year. In this interview, he discusses the show at the Curran, and delves into elements of his career. Also: excerpts from an interview with Rachel York, one of the performers in “Head Over Heels,” and a review of “The Effect” at San Francisco Playhouse.